What Day Of The Week Is June 11? 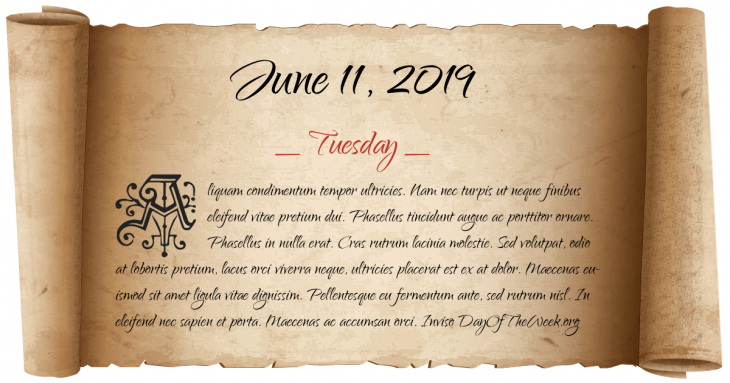 June 11, 2019 is the 162nd day of the year 2019 in the Gregorian calendar. There are 203 days remaining until the end of the year. The day of the week is Tuesday. New Zealand annexes the Cook Islands. USS Missouri the last battleship built by the United States Navy and future site of the signing of the Japanese Instrument of Surrender, is commissioned. Buddhist monk Thich Quang Duc burns himself with gasoline in a busy Saigon intersection to protest the lack of religious freedom in South Vietnam. Who were born on June 11?